It may have been a rather grey and blustery day in Plymouth but Her Royal Highness; The Princess Royal received a very warm welcome from Commodore Ian Jess, The Naval Base Commander at Devonport, when he greeted her at the start of her visit to HMS Albion. The Princess launched the 22000 Ton Assault in 2001 and is the ship’s official sponsor. 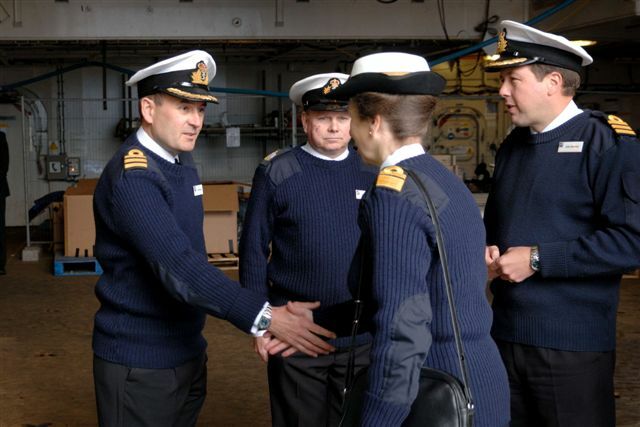 After a short drive to the ship’s berth at 5 Basin, Her Royal Highness was introduced to the ship’s Commanding Officer, Commander John Gardner. Before starting the tour of the ship, Commander Gardner introduced the Princess to Babcock Marine senior management, Director Surface Warships Mr Chris Tomkins and Project Manager Mr Mike Weeks. As many readers will know, HMS Albion is currently undergoing a £30 Million maintenance period in Devonport. The Princess was eager to hear how successful the partnering arrangement has been between Babcock Marine, the main contractor and the Ministry of Defence. Introductions over, the VIP party moved quickly up to the Petty Officers’ accommodation where Her Royal Highness could see first hand some of the improvements made to the living spaces. Space on warships is always at a premium and finance is tight but Albion is home to some 300 sailors and marines and the work to improve living quarters has been very welcome. The Princess met a number of ship’s company and spoke briefly about the ship’s most recent deployment, to West Africa. This being the first visit to HMS Albion in almost a year, the Princess heard how the Presidents of Sierra Leone and Nigeria had been hosted onboard as well as how members of the ship’s company had taken part in small projects ashore. It was then on to the Junior Rates Dining Hall to meet members of the Royal Marines Assault Squadron – several of the marines have been on operations in Afghanistan, Marine Peter Penning (22 from Mitcham in Surrey) said “it is good that the Princess is visiting Albion and that she and the whole Royal family recognise the work that the armed forces are doing, particularly in Afghanistan”. Here the Princess was told how last year Albion embarked marines from the Netherlands as part of the regeneration of the long standing partnership between the Netherlands and the United Kingdom which sees marines from both countries working closely together. After another short visit to witness how work had progressed in a sailors mess deck it was up to the Bridge where the Princess met Commander Ian Atkinson, Commander Engineering and other technicians, including Babcock Marine employees. Engineering Technician Joanna Drohan (19 from Nottingham) said she was very excited that the Princess was visiting Albion and would see all of the hard work that had gone into the maintenance period. The Princess asked specifically about some of the package of enhancements and was told that among other work, the ship now had a very slick paintjob on the hull which should improve fuel efficiency, as well as being much more environmentally friendly. The next event in the packed visit programme was a series of medal and award presentations including Long Service clasps to Lieutenant Commander Mark Simpson and Warrant Officer Jimmy Jewell and a Joint Commander’s Commendation to Colour Sergeant Dave Young (Royal Marines), the latter for an act of bravery while he was in Afghanistan in early 2008 when he led the extraction of a wounded colleague while under persistent enemy fire. In recognition of the day and noting Her Royal Highness’s love of Scimitar sports cars, Commander Gardner presented the Princess with a letter opener in the shape of a scimitar sword, fashioned onboard by Warrant Officer Jewell from off cuts of metal waste from around the ship. After a quick lunch and a change into civilian attire, Her Royal Highness left for her next engagement in Exeter. As the Royal party moved away from the gangway, Commander Gardner commented how knowledgeable Her Royal Highness had been about the ship. He said it had been a memorable morning for many of the ship’s company and that Her Royal Highness had clearly appreciated the opportunity to discuss the maintenance period and the ship’s eventual return to the operational fleet.